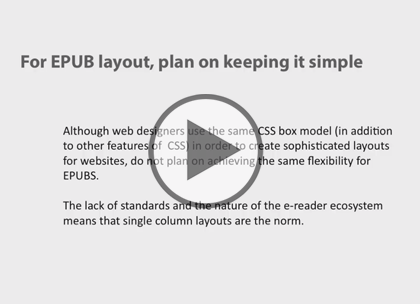 In this 3 part learning series you’ll learn how to style electronic publications (ePub) for web viewing. The courses will start with an introduction to ePub, the CSS is, then Class and inline Styles. You will then learn how to edit text, starting with formatting, addressing headers, creating lists and adding page breaks. You will then learn how to create hyperlinks in your document, change fonts, add images and tables then to close you will see how to use multimedia and other options. This course assumes familiarity with Adobe Digital Publishing Suite. This course is part of a 3 part learning series. The courses should be taken in the following order, ePub Styling Essentials: CSS; ePub Styling Essentials: Text Formatting; and ePub Styling Essentials: Adding Media.